Here's a superb new online slots game from Rival Gaming which you can play. Frances Hodgson Burnett’s magical book ‘The Secret Garden’ tells the story of an unhappy orphaned girl, Mary, sent to live with a distant relative. Mary finds purpose, peace, and joy upon discovering a secret garden, locked away because of her uncle’s sad memories. 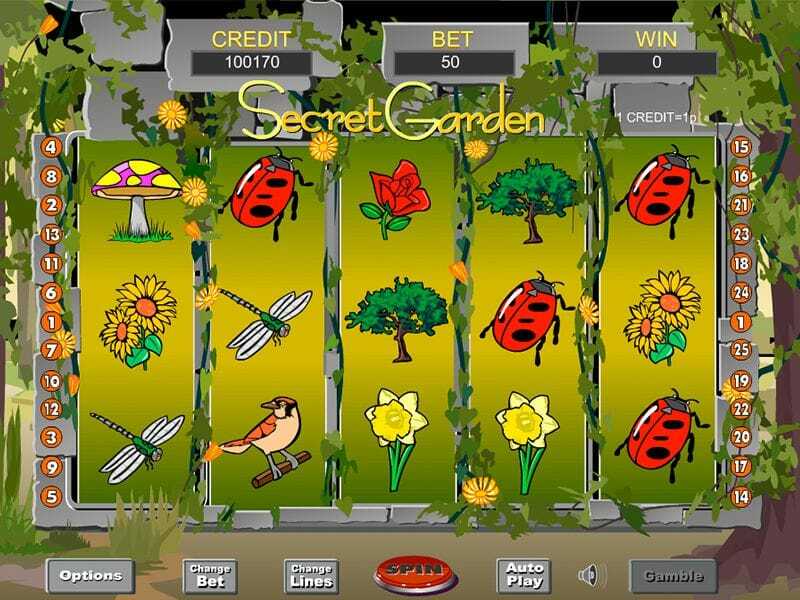 Secret Garden online slot game retains all the charm of the children’s book, alongside an opportunity for adult cash prizes. Its vibrant artwork is sure to enchant even players new to online slots, and its fertile winning opportunities will provide a bumper crop of fun for long-time Slots Games enthusiasts. Pull on your wellington boots, grab a spade, and get ready to cultivate some cash wins! 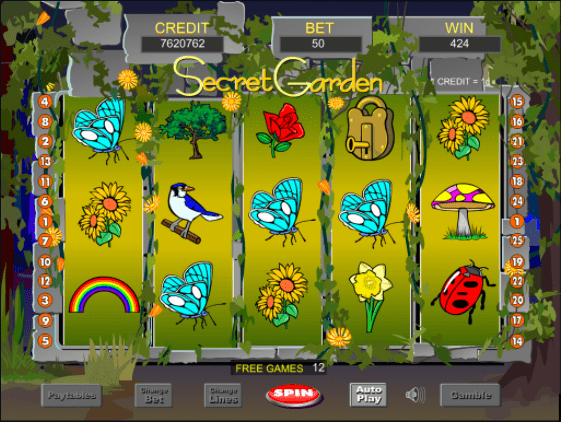 Secret Garden is preceded by a short opening sequence, in which we are welcomed through the mysterious gates of the garden, building anticipation, and beckoning the player into the game’s world from the outset. The main game screen has 5 reels against a background of tangled vines and potted sunflowers (which you can press to bring up handy paytable diagrams). Symbols are lovingly and whimsically illustrated enough to feature in a children’s book. Amongst them are squirrels clutching nuts, rabbits chowing down on huge carrots, brass watering cans, and little girls peering at flowers. WILDS – Duck symbols are WILD, and substitute for other symbols. 5 of them along a pay line, too, will have you quacking with delight, as this means a win of 5,000 coins. 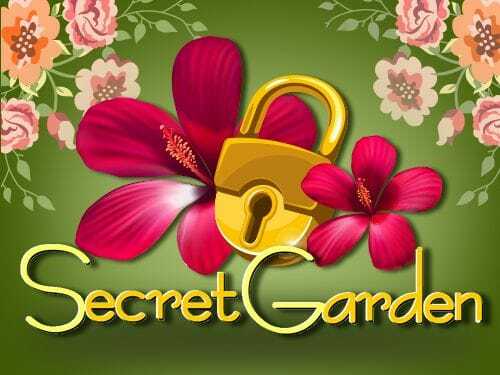 SECRET GARDEN BONUS – 3 or more Key symbols will open the door to this secret bonus game. You’re equipped with a watering can, and must water plants. If they respond positively to the hydration and grow, you win prizes, and your watering can gets topped up for the chance to win more. This plants the seed for small prizes to grow into large ones. The features are in keeping with the overall theme, and live happily and organically amidst the regular gameplay. The music is bright, magical and upbeat, and immerses you in the world of the game.